If you are a parent and you live in the Seattle area, chances are you have heard of Caspar Babypants. Mr. Babypants is the alter ego of Chris Ballew, otherwise known as the lead singer of The Presidents of the United States of America and also former schoolmate of mine. (He was several years ahead of me so while I knew who he was, he had no idea I existed.) Caspar Babypants has four CDs of music out that are extremely unique in that kids and adults alike know and love the songs. I will get them stuck in my head for days. My kids know the words and whenever we see him around town (he does frequent and free shows), I am always amazed at how the kids just dig him. One of his songs is called “Baby in a Corn Tree” and has the lyric, “Baby in a corn tree, wants to wear a poncho, flying through the river on a steaming hot day.” It makes no sense but it is catchy. So catchy in fact, that whenever I contemplate making or eating corn, this very lyric pops into my head. Seeing as we are barreling down the path to full-blown corn season, this could be a problem. It’s worth it though, having a children’s song lyric that makes no sense stuck in my head for the next month or so, if it means I can eat things like this pie. I had a, uh, moment last night with my husband over this pie. I made it because I have been wanting to ever since it came out in Gourmet (sniff), because I needed to test it for some upcoming classes, because it sounded so incredibly good to me, and because I thought Randy would love it. 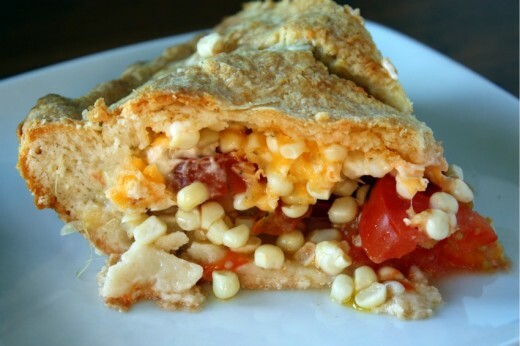 A tender crust, tomatoes, fresh corn, herbs, sharp Cheddar cheese – all right up Randy’s alley, especially the corn part. But no. He liked the crust but thought the filling needed more “oomph”. What exactly have I created here? Randy is, of course, welcome to his opinions and is generous with his praise when he likes something, but disappointed because of lack of “oomph” in a homemade savory pie on a Monday night? People, can I get an amen here? For the record, in my opinion, there was no lack of oomph. It’s summer and that means that good ingredients speak for themselves. There is no need for a thick custard filling when tomatoes and corn and herbs are at seasonal perfection. 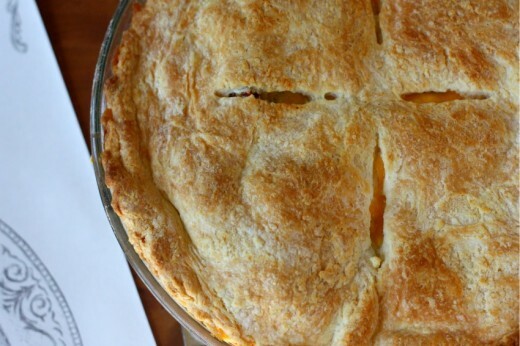 The crust is super easy to make and is perfect for this particular pie – not too crust-like, more like a biscuit. I wondered why a bit of mayo thinned with lemon juice made an appearance here but it was a perfect bit of creaminess without being too heavy. As much as I loved Gourmet and as much as I miss receiving it in my mailbox every month, their recipes often seemed overly fussy to me. I have streamlined this one a bit to make it more of a weeknight meal. Preheat oven to 400ºF. Whisk together flour, baking powder, and ¾ tsp. 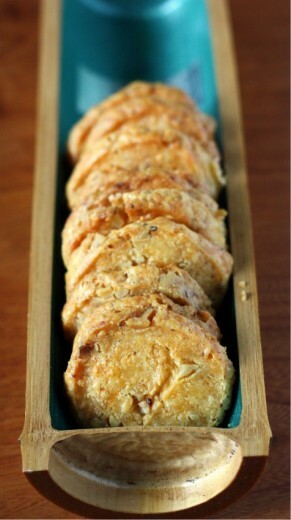 salt, then blend in cold butter (¾ stick) with your fingertips or a pastry blender until is resembles coarse meal. Add milk, stirring until mixture just forms a dough, then gather into a ball. Divide dough in half and roll out 1 piece on a lightly floured surface, into a 12-inch round. The dough is pretty sticky, so be sure to keep moving it around the surface and sprinkling lightly with flour as needed. Roll the dough over the rolling pin and unroll it into a 9-inch pie plate. Pat into place with your fingers and trim any overhang. Whisk together mayonnaise and lemon juice. You want a thick pourable consistency, so add more lemon juice if necessary. 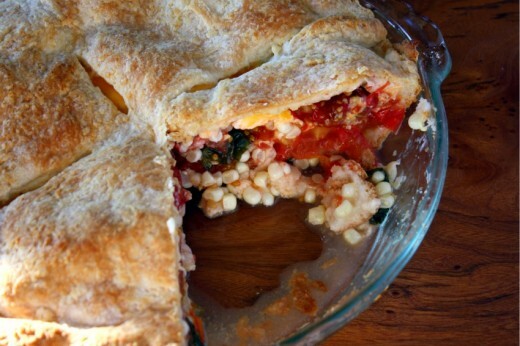 Arrange half of the tomatoes in crust, overlapping, and sprinkle with half the corn half the herbs, ½ tsp. salt, and a few grinds of pepper. Repeat with another layer of the same. Sprinkle with half the cheese. Pour lemon mayonnaise over filling and sprinkle with remaining cheese. Roll out remaining piece of dough into a 12-inch round in same manner, then fit over filling, folding overhang under edge of bottom crust and pinching edge to seal. Cut 4 steam vents in top crust and brush crust with melted butter (2 tsp). Bake pie until crust is golden and filling is bubbling, 30 to 35 minutes, then cool on a rack. Serve warm or at room temperature. Let’s take a little quiz. In each of the following scenarios, which would you choose? Store-bought cracker or store-bought cookie? Store-bought cracker or homemade cookie? 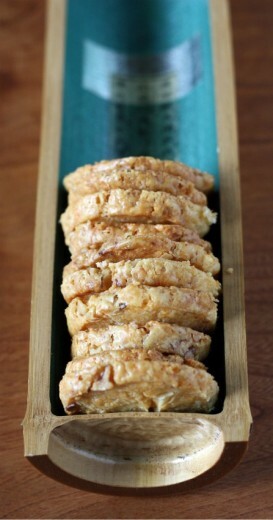 Homemade cracker or store-bought cookie? Homemade cracker or homemade cookie? It might surprise (shock? repulse?) you to know that I would choose the cracker. Yes, if the store-bought cracker was nice and salty, like maybe a Triscuit, I would choose it over a homemade cookie. What can I say – I’m a savory girl. Knowing that, it probably won’t surprise you to hear that I have fallen head over heels in love with these crackers. I have been a big fan of making my own crackers and until recently, I had my two favorites. But move over kids, there is a new cracker in town. I just served these to my Vegetarian Basics class last week. One of my attendees – a good friend – suggested I call them (Crack)ers. Has someone else copyrighted that name yet? It’s perfect. This is about as easy as it gets. 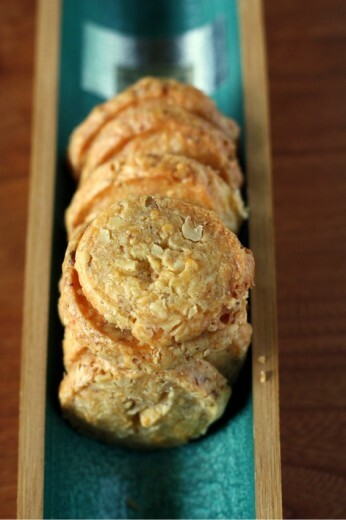 Soften butter, toast nuts, grate cheese, and you are basically there. Having made them several times now, I can give you some tips. 1) This is the time for good Cheddar cheese. We always have some mild stuff in the cheese drawer for kids quesadillas and you probably do too. Don’t use that cheese. Buy something special and yummy. It will make a difference. 2) Chop the walnuts nice and fine. 3) Double the recipe. Form the dough into two logs, bake one off and wrap and freeze the other. Tiny bit more work for double the crackers and the dough freezes beautifully. 4) If you follow tip #3 and you use a Beater Blade for your standing mixer, switch to the metal blade. This is a very stiff dough and when I quadrupled the recipe (what? 2 sticks and butter and 2 pounds of cheese – I’m not scared), I broke my beater blade. You have been warned. 5) As you are mixing in the flour, you might think to yourself, “This needs some liquid, like milk perhaps.” It doesn’t. (Made that mistake!) Be patient and the dough will come together. 6) Make sure the walnuts are distributed well throughout the dough, otherwise it can be a little tricky to get to the dough to roll out into a snake without falling apart. Totally do-able, just a little annoying. 7) Finally, prepare yourself for the smell coming out of your oven. Ah-mazing! I’m not giving you a yield here because it totally depends on how small your dough logs are, how thin you slice your crackers, etc. The original recipe said you can get fifty 1-inch round crackers, but honestly I don’t see how that is possible. In a small mixing bowl, stir together the flour, salt, cayenne pepper, and black pepper. Set aside. In the bowl of a stand mixer fitted with the paddle attachment, combine the cheese and butter and beat on medium speed until combined. Add the flour mixture and beat on low speed until incorporated. Stop the mixer and scrape down the sides of the bowl with a rubber spatula. Mix in the walnuts on low speed. The dough should be fairly stiff with small chunks of cheese and walnut visible. Transfer the dough to parchment paper, waxed paper, or plastic wrap and shape into a log about 1-inch in diameter. (DT: I found it difficult to get the dough this small, so my crackers were bigger. Darn.) Wrap well and place in the refrigerator until hard, about 2 hours. Preheat the oven to 400ºF. Line a baking sheet with parchment paper or a non-stick liner. Unwrap the log and cut crosswise into ¼-inch thick slices. Arrange the crackers on the prepared pan, spacing them apart about 1 inch. Bake the crackers until golden brown on the edges and lighter in the center, 7 to 10 minutes, depending on size and thickness. Transfer to a wire rack and let cool completely. The crackers will keep in an airtight container in cool dry place for up to 2 weeks. I have been keeping something from you. Well, not keeping from you per se, but just not sharing. It is time to come clean. I’ve been baking a lot of bread. No-knead bread to be exact. I’ve been making loaves to to serve to my classes and for every dinner party in recent memory. 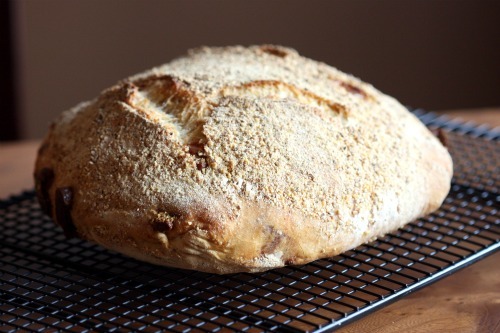 I know, no-knead bread is so 2008 (2006 is actually when it first graced the pages of the New York Times). What can I say? I’m a late adopter. The fact that everyone was writing about it and raving about it is precisely why I decided not to make it. I was so over hearing and reading about it, so over it I didn’t even want to attempt making the bread. Which is a shame because this, as you have no doubt heard many times before, is the best bread I have ever made. And by far the easiest. 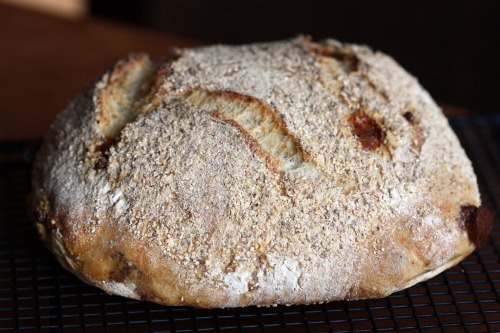 Jim Lahey’s wonderful book My Bread has wonderful step by step photos and includes many delectable variations of his masterpiece. Until recently, I did not feel any need to stray from the original. Why mess with perfection? But the cheese bread was calling my name. I decided to use, on Lahey’s recommendation, a young Pecorino. When I found myself in a cheese shop, I realized I had no idea of how much I was supposed to buy and decided to err on the side of too much. So, if you are attending one of my upcoming classes or coming to my house for a dinner party in the near future, you will be having cheese bread. There are worse things. In my mind, there are only two tricky things about making this or any of the other no-knead breads in this book. One is timing and the other is getting the dough out of the towel and into the extremely hot pot without burning yourself. I can’t really give you any advice on the latter except be really careful. As for the former, this is what works for me. I start my dough at around 8pm the night before I want to serve the bread. That way, it will be done with it’s first (very long) rise around 2pm. I let it rise for another two hours which puts in the oven at around 4pm. After almost an hour of baking, it’s done around 5pm. That way, it has plenty of time to cool before I want to serve it. 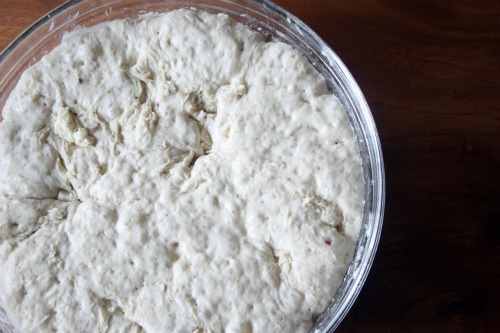 If you think starting a dough after you have already made and cleaned up dinner (and possibly given your kids a bath and read them stories) sounds daunting, it takes literally 2 minutes of your time to do. Most good bakers will tell you to measure by weight, not by volume. I admit to usually resorting to my good old measuring cups – except with this recipe. I encourage you to try it here – even fewer dishes to wash! 1. In a medium bowl, stir together the flour, cheese, salt, yeast, and pepper. Add the water and, using a wooden spoon or your hand, mix until you have a wet, sticky dough, about 30 seconds. Cover the bowl and let sit at room temperature until the surface is dotted with bubbles and the dough is more than doubled in size, 12 to 18 hours. 2. When the first rise is complete, generously dust a work surface with flour. Use a bowl scraper or rubber spatula to scrape the dough out of the bowl in one piece. Using lightly floured hands or a bowl scraper or spatula, lift the edges of the dough in toward the center. Nudge and tuck in the edges of the dough to make it round. 3. Place a tea towel on your work surface and generously dust it with wheat bran, cornmeal, or flour. (DT: I always use cornmeal for this step. I like the added crunch.) Gently place the dough on the towel, seam side down. If the dough is tacky, dust the top lightly with flour. Fold the ends of the tea towel loosely over the dough to cover it and place it in a warm, draft-free spot to rise for 1 to 2 hours. The dough is ready when it is almost doubled. If you gently poke it with your finger, it should hold the impression. If it springs back, let it rise for another 15 minutes. 5. Using pot holders, carefully remove the preheated pot from the oven and uncover it. Unfold the tea towel and quickly but gently invert the dough into the pot, seam side up. Cover the pot and bake for 30 minutes. 6. Remove the lid and continue baking until the bread is a deep chestnut color but not burnt, 15 to 20 minutes more. Use a heatproof spatula or pot holders to gently lift the bread out of the pot and place it on a rack to cool thoroughly. Thank you all for your sympathy over my challenging week. First let me tell you that my kids are fine. I took Graham to the ER at 4am on Tuesday because he had been complaining for days of a tummy ache and woke up in the middle of the night crying. Since that is completely unlike him, I started to really worry. After many hours and tests, he is fine and fond of telling anyone who will listen how brave he was with the doctor. Second, I have to be honest and tell you the only reason that I persevered and made that Pasticcio and this most favorite lemon tart is because I had friends coming over for dinner. If it had just been Randy and me, I would not have hesitated to punt on cooking and ordered in. I even considered take-out for my dinner guests but I already had all the ingredients on hand and we needed to celebrate one in our midst. This small group is friends from a co-op preschool. We attended for two years when Graham was one and two years old. I met an amazing group of women there and a few of us have remained close. We try to get together at least monthly and our evening usually (ok, always) revolve around food and drink. I will often offer to host when Randy is out of town because I do so love these women and it gives me something to look forward to. One of our group is about to give birth to her fourth child. Yes, fourth. She, more than almost anyone I know, is equipped with the energy, the boundless love, and the sense of humor that four children requires. It is just a couple of weeks before her due date and I thought a special dinner was in order before all hell breaks loose in her house. Again. So you see, I had to make dinner. And dessert. I can’t send a dear friend off to infant-land on a dinner of takeout pizza and boxed cookies, right? Plus I needed an excuse to make this lemon tart. A few weeks ago, I received an email from a reader saying she had a plethora of Meyer lemons and wondered what to do with them. I didn’t hesitate to tell her she should make this tart from the Tartine cookbook. And then I realized that I had not posted the recipe. I wrote about it, way back in May of 2008, the second post ever on this blog, but there was no photo and no recipe. Considering this a fall-back recipe, one I make over and over, it really needs to be here in all its glory. 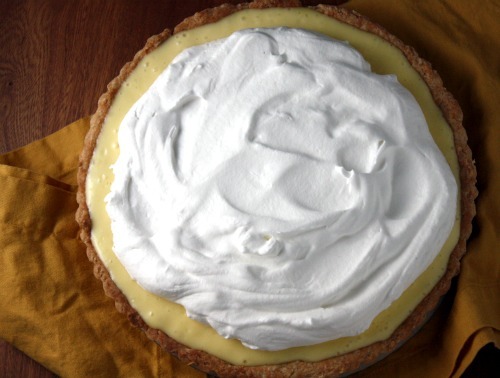 Until I started making this particular tart, all the other lemon tarts in my life featured lemon curd as a filling. I like lemon curd as much as the next person, but something about all those tarts just did not taste right. A little metallic, a little funky. 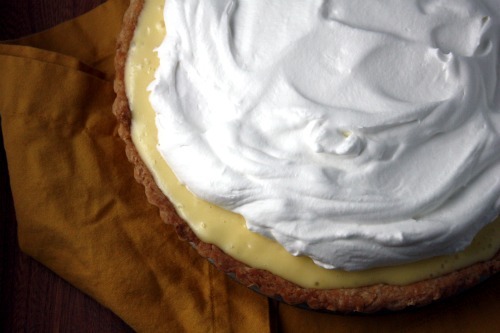 This tart uses lemon cream and the addition of butter makes all the difference. The cream is silky smooth but with over a half cup of lemon juice, it has the perfect amount of pucker. The sour marries perfectly with the Tartine sweet crust. For last week’s tart, I had a round of my favorite tart dough in the freezer and a hole in my ceiling, so I decided to save myself the step of making the Tartine crust. But truthfully, for this tart, theirs is better. It is sweeter and the balance against the sour lemon is intoxicating. A few notes. This dough recipe will yield 4 tart crusts. They freeze beautifully, so don’t be tempted to scale down the recipe. Just set one aside in the fridge and wrap the other three, separately, in plastic wrap and then foil. Put them in a Ziploc bag, date it, and put in the freezer. They will keep at least one month and possibly two. You can use this crust for any sweet tart that goes in a 9-inch tart pan (which is the most common size). Also, I use my immersion blender to mix the butter into the lemon cream and while that might sound strange, it works really well. I made a few changes in the recipe just in terms of streamlining and personal taste. Using a stand mixer fitted with the paddle attachment, combine the butter, sugar, and salt and mix on medium speed until smooth. Mix in 1 egg. Add the remaining egg and mix until smooth. Stop the mixer and scrape down the sides of the bowl with a rubber spatula. Add the flour all at once and mix on low speed just until incorporated. Place the dough on a lightly floured work surface and roll out to 1/8-inch thick round, rolling from the center toward the edge in all directions. Lift and rotate the dough a quarter turn after every few strokes, dusting underneath as necessary to discourage sticking, and work quickly to prevent the dough from becoming too warm. Roll the dough out to an 11-inch circle. If the dough becomes too soft to work with, place it in the refrigerator briefly. Loosely roll the dough onto the rolling pin and then unroll it into a 9-inch tart pan. Carefully coax the dough into the pan without stretching it, but making sure it is touching the whole bottom of the pan and is in the “corners”. Fold the excess dough over to double the thickness of the sides. Dock (make small holes in) the bottom of the pan with a fork or a knife and place the pastry shell in the freezer for 15 minutes. Preheat oven to 325ºF. Place in the oven and bake for 12 to 15 minutes, or until golden brown. Let cool completely on a wire rack. Pour water to a depth of about 2 inches into a saucepan, place over medium heat, and bring to a simmer. Combine the lemon juice, whole eggs, egg yolk, sugar, and salt in a stainless-steel bowl that will rest securely in the rim of saucepan over, not touching, the water. Whisk the lemon juice, eggs, yolk, sugar, and salt together. (Never let the egg yolks and sugar sit together for more than a moment without stirring; the eggs will “cook” the yolks and turn them granular.) Place the bowl over the saucepan and continue to whisk until the mixture becomes very thick and registers 180ºF on a thermometer. This will take 10 to 12 minutes. Remove the bowl from over the water and let cool to 140ºF, stirring occasionally from time to time to release the heat. Meanwhile, cut the butter into 1 tablespoon pieces. When the cream is ready, leave it in the bowl if using an immersion blender, or pour it into a counter top blender. With the blender running, add the butter 1 tablespoon at at time, blending after each addition until incorporated before adding the next piece. The cream will be pale yellow and opaque and quite thick. You can use the cream immediately, or pour it into a storage container with a tight-fitting lid and refrigerate for up to 5 days. To use after refrigeration, gently heat in a stainless-steel bowl set over simmer water until it has softened. Make sure the tart shell is completely cool. 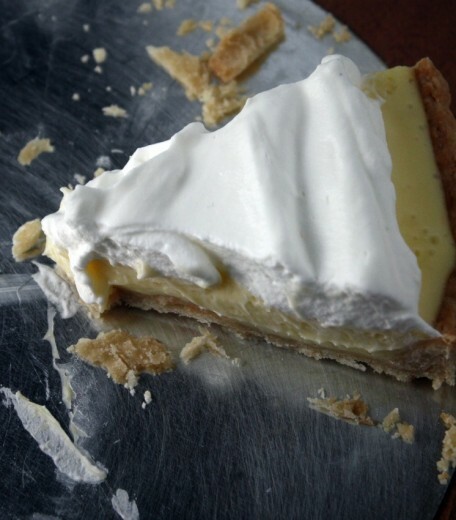 Pour the lemon cream filling into the crust and smooth the top. Chill the tart until firm, about 2 hours, before serving. It will keep for up to 3 days in the refrigerator. To serve the tart, in a mixing bowl, whip the cream with a whisk until thickened. (DT: I used my hand mixer.) Add the sugar and whip until the cream holds soft peaks. 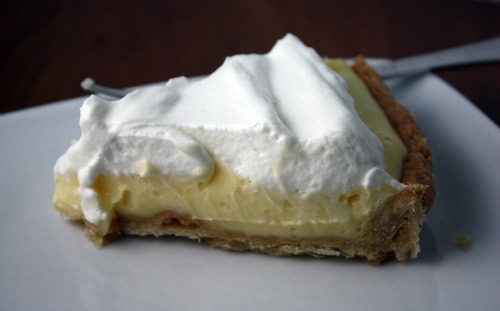 Top the tart with the whipped cream. Serve the tart cool. Last week something amazing happened. On Thursday, at around noon, I sat and had a lunch date with my husband. In the 6½ years since we returned from London, we had never done that. I don’t think we ever did it in London either for that matter. The reason for the lack of lunch dates? Randy worked at a very large company located across the lake from our house, a company well-known for a certain “culture”. A company called Microsoft. Perhaps you have heard of it? Perhaps you know its reputation for asking a lot of their employees? Basically, the guy has not slowed down since the day he was born. Microsoft LOVES people like that. All along, his career has afforded us a wonderful lifestyle but has also been hard on me and our family. For the first five years of having children, he rarely saw them during the week. Because of the commute, he was on the road before they were awake and home after they were in bed. In the last year and a half, his office moved to the Seattle side of the lake and things got significantly better. But then his travel schedule picked up dramatically and he was out of state 50-60% of the time. He would come home and be exhausted from time changes plus the overall stress of travel and the job. Periodically we would check in. Is it worth it? Are we ok? Are the kids ok? I would worry about him. Waking up at 3am and not being able to fall back to sleep night after night because of stress is not sustainable. To be fair, that was an extreme. Most of the time, life as a Microsoft employee was challenging but not over the top. He was very successful there and they recognized his hard work. He was promoted steadily and received awards for the work he did. And for the most part, he enjoyed his actual job, the work he did day to day. He did not enjoy the constant “re-orging” and never being sure if the job he was doing that day would be there the next. And then one day, Randy had had enough. It was one request too many or one too many trips. Maybe it was looking at Graham and thinking, “I have a six year old and I have not been here”. Whatever it was, he reached a breaking point. He reached out to his considerable network and started taking recruiting calls more seriously. A company that had already approached him about a job twice re-appeared, this time with a friend of over 20 years as CEO. Coffees, conversations, and number crunching happened. As a family, we weighed the pros and cons. I had always heard that term “golden handcuffs” but working through the decision, I really came to understand what it meant. In all the years with Microsoft, we never paid a single cent for health care. No monthly fees, no co-pays, no deductibles, no cost for drugs. My two c-sections, Randy’s knee surgery, a herniated belly button surgery for Graham, four years of speech therapy, all the pediatric visits, and the two emergency room visits – we never paid a dime. It is probably the best health care in the United States. To me that was much more valuable than the stock left behind. The fact that Randy would be taking a pay cut and our benefits would become more like most Americans (at least those who have health care) were the cons for the new job. The pros list was less tangible and more emotional. Working alongside two people he admires without question, an office 2.1 miles from our house, 25% travel at the most, a conscious decision to slow down – to be more present in our family. It was that last one we really discussed. For him to make this move, it had to be a lifestyle move, not just a job change. I give him a lot of credit. He was climbing the corporate ladder. He had over 300 people reporting to him. He had tremendous success. And he decided that having lunch with his wife once a week was more important. This new job is going to be very challenging. He will still work very hard – he doesn’t know how to work any other way. But he will go on field trips with Graham, he will be home at 6 (!) every night, he will sleep better, and learn from a trusted friend. I have always loved the idea of sending Randy to work with a weekly treat. But Randy has always worked in groups that were too large for it to make sense. Now that he is at a much smaller company, the weekly treat tradition has begun. His first week, I asked what he wanted me to make. I knew it would either be the White Chocolate Almond Chunk Cookies or the Cowgirl Cookies, so I already had the Holly B’s cookbook in hand when I asked. Sure enough, the Cowgirls won out. This week, I made something new. I was paging through my Tartine book, looking for the Lemon Cream recipe for last week’s party, when I happened upon this chocolate amazingness. 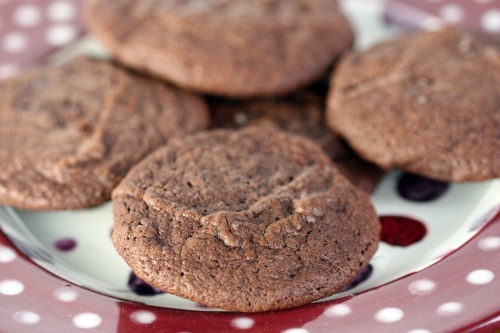 How is it that my chocolate loving self never made these? I know they don’t look like much, but they are one of my most favorite cookies ever. 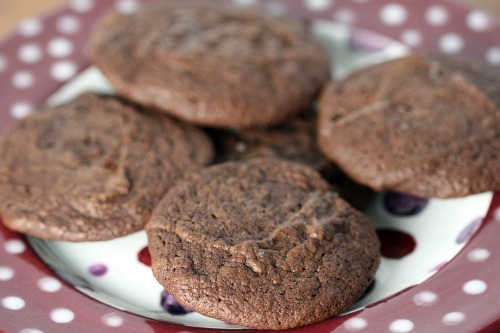 Essentially, they are a regular cocoa-based chocolate cookie to which you add a half pound of melted bittersweet chocolate. The batter is like ganache and you pull the cookies out when they are just starting to set and the end result is like a chocolate pillow that you will want to sleep on forever. As I was scooping them out, I thought a scattering of chocolate chips might be good for texture, but no no no! No texture needed. My only change is that I scattered a bit of sea salt (smoked Chardonnay if you must know) over the top of each cookie before baking and that was a good decision. These cookies are very soft when you take them out of the oven so I would advise letting them rest on their baking sheet for a few minutes before moving them to the cooling rack. Preheat the oven to 350ºF. Butter a baking sheet or line with parchment paper. Pour water to a depth of about 2 inches into a saucepan, place over medium heat, and bring to a simmer. Put the chocolate into a stainless-steel bowl that will rest securely in the rim of the pan and place it over, not touching, the water. Make sure the pan is completely dry before you add the chocolate and that no moisture gets into the chocolate. 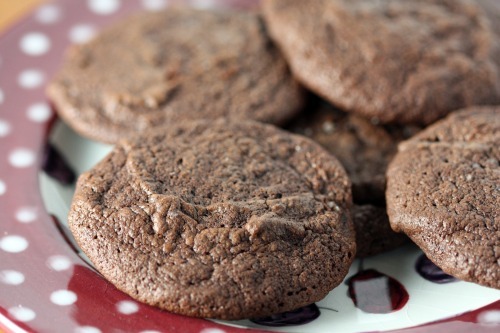 Moisture will cause the chocolate to seize, or develop lumps. Heat, stirring occasionally, just until the chocolate melts and is smooth. Remove from the heat and let cool. Stir together the flour, cocoa powder, and baking powder in a bowl. Set aside. Using a stand mixer fitted with the paddle attachment, beat the butter on medium-high speed until creamy. Slowly add the sugar and mix until the mixture is completely smooth and soft. Stop the mixer and scrape down the sides of the bowl with a rubber spatula as needed. Add the eggs one at a time, mixing well after each addition until incorporated before adding the next egg. Beat in the salt and vanilla, and then add the melted chocolate and beat until incorporated. Add the milk and beat until combined. Finally, add the flour mixture and beat on low speed until incorporated. Drop the dough by heaping tablespoonfuls onto the prepared sheet, spacing them about 1 inch apart. Bake the cookies until they are just barely firm on top when lightly touched but are still very soft underneath, about 7 minutes. They wil get firmer as they cool. Transfer the cookies to a wire rack and let cool. They will keep in an airtight container at room temperature for several days.